I wrote a while ago about my obsession with my Instant Pot. I’ve been using it every weekend to prepare for the week ahead. There’s lot of ways to do this, but I thought I’d share my most recent menu and how I combined the pieces to make a variety of meals. Meal planning with the Instant Pot couldn’t be easier. I did this over two days. 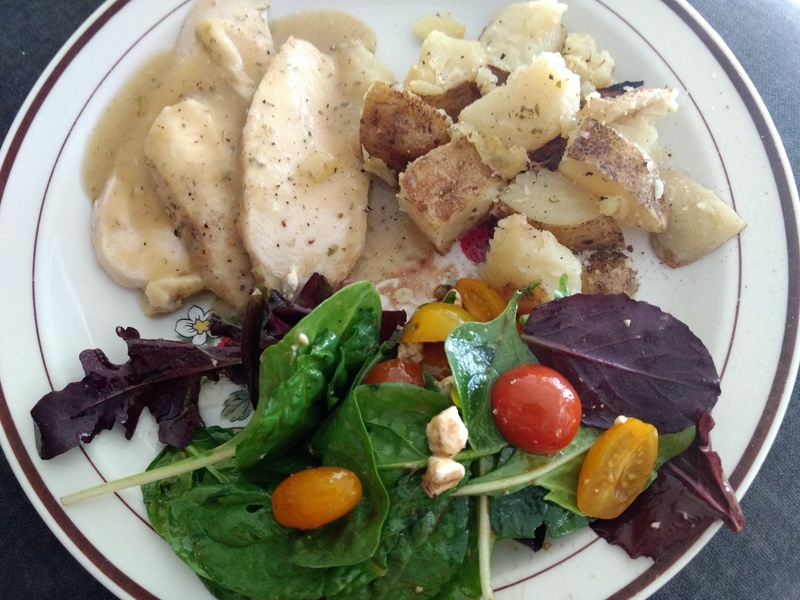 The finished product: lemon chicken, potatoes, gravy and a salad. I sliced the garlic cloves in half and added them and the potatoes to the broth. I set my trivet in on top, making sure it was solidly in contact with the bottom of the pot, and then set the steamer tray on top of it. I squeezed the juice of half a lemon, cut in half again, over the chicken and then tucked the squished lemon pieces in on the sides of the chicken in the basket. I used the poultry setting for 12 minutes, then let it naturally release pressure for about 5 minutes before releasing it completely. I pulled the steamer basket out with tongs and set it aside to cool. Then I scooped the potatoes and garlic out with a slotted spoon. Then, I mixed a heaping teaspoon of corn starch in about 1/2 cup cold water, and added that back into the remaining sauce in the Instant Pot. I turned it back on saute and cooked it down until it was like gravy. I cleaned all the parts of the Instant Pot and set up for Round 2. Process: Mix the broth and spices and add the juice of 1/4 lime. I threw the lime wedges in with the chicken as it cooked but don’t forget to pick it back out if you do this! I sliced as much of the chicken off the bone as I could, leaving it in fajita-sized strips. I just threw the rest of the bone with meat on it in and picked it off when it was cooked. I browned the chicken in the Instant Pot (I used coconut oil this time.) Then I added the peppers, onions and spicy broth to the bottom and scraped around to clear up any brown spots. I chucked the squished limes in too. I turned the Instant Pot on for 8 minutes on the poultry setting. I released the steam right when it finished. I used a slotted spoon to pick out the limes, then scooped out the chicken and veggies, setting the chunk with the bone aside so I could pick off the usable meat. Finally, I strained the remaining broth from the Pot into a container and saved it for Day 2. Also: place 1 pound of black beans in a bowl of water to soak overnight; cook it on Day 2! Process: Okay full disclosure, I just used my rice cooker for this one because it’s easier to wash. You can cook rice in the Instant Pot, though! I combined this into several meals, using just a few extra ingredients (in bold) here and there. So there you have it. With a couple of days of gluten-, soy- and dairy-free cooking, this was pretty much a week’s worth of lunches and dinners for me (there were a couple repeats in there.) 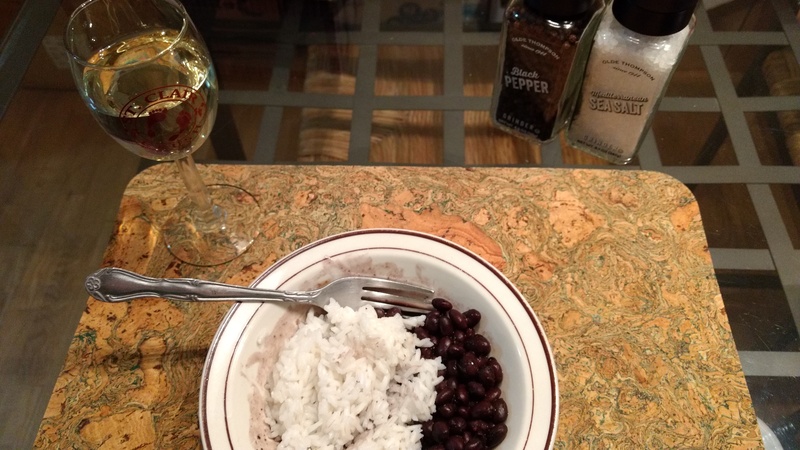 The key to this is to get your time-consuming things out of the way – for me, that’s meat, beans and rice (yes I know rice only takes 20-30 minutes, but I only have about 40 minutes at home for my lunch “hour.”) Then I just added easy things: I can warm a tortilla in a pan, open a bag of salad, or smash up an avocado in under five minutes. The asparagus might have taken 10, as did the fried rice. Do you prepare meals ahead of time? Do you work from base ingredients, or do you package up set meals for the whole week? Tell me in the comments!